MOF means one of the best craftsmen of France - un des meilleurs ouvriers de France. It’s a craftsmens' competition held every four years. After months, if not years of training, and after several weeks of sharp competition the best craftsman in each category of trade is designated. Every four years? Like the Olympics? Right. Exactly like the Olympics, and I'm pretty sure that many people in France are convinced that it's more important to become a MOF than to win a gold medal. After all, it's about honouring the best of the best. Becoming a MOF is like joining a very small and very exclusice club. Once you're in, you're allowed to wear unmistakable insignia every child in France immediately recognizes: the MOF's gold medal is in fact a collar in the colours of France. Wearing this bleu-blanc-rouge band around your neck means: you've made it. In your profession, you can't really get further than that. Yes, you can hold your head up high. So here we are again. 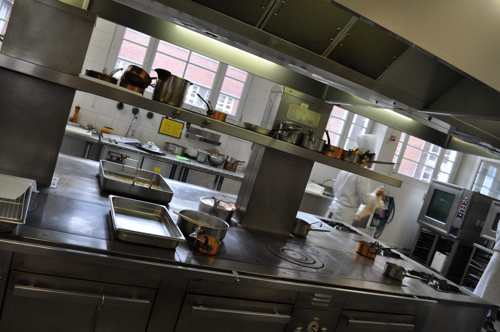 Tuesday and Wednesday of this week saw the regional qualification rounds for the MOF's gastronomy competition. More than 500 candidates were struggling all over the country. I had the chance to sneak into Ecole Ferrandi, one of the prestigious gastronomic schools of Paris where they teach what you have to know in order to become a grand chef. Imagine the excitement: candidates who had prepared for the competition for months, if not years, arrived at five o'clock in the morning. The written examinations came first. The real thing came second, with shock and awe. 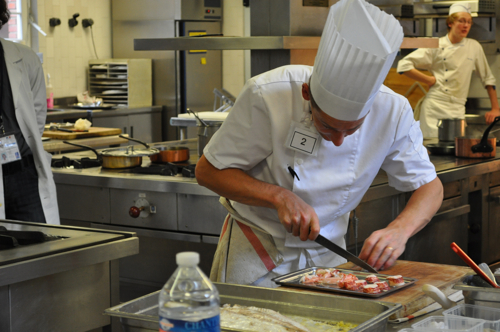 The candidates had to prepare two gastronomic dishes. In four hours. Sounds like a TV format? It's far more serious and dramatic. You might think that four hours is a lot of time. Well, that's where you're wrong. You have no idea what the MOF jury understands by the word “gastronomic”. They really mean it! It's a meal so sophisticated that it figures on the UNESCO-list of immaterial cultural heritage now, have you heard about it? On the MOF menu: carrelet braisé et laqué au beurre de homard followed by a pie de canard aux navets. Don’t ask me to translate this literally. Let’s say it’s about plaice, lobster, a pie and a duck. In the end it was fun to see and feel the excitement in the kitchen. The chef was there with his stopwatch and shouted: “Two minutes for number three”. Timing was rigorous, the chef incorruptible. And whereas the pots were heating up and the candidatess in the kitchen tried to keep their heads cool, I talked to the only female member of the jury, a lady of a certain age, who’s nickname was “the eye of Moscow”. Finally, the jury was served. At the tables, behind the plates, Eric Frechon was to be spotted, president of the event at Ferrandi and three-star-chef at the Bristol; Alain Senderens, one of the first French cooks to famously give back his three Michelin stars, colleagues in white and some in black or fully incognito like William Ledeuil from Ze Kitchen Galerie. They observed, they tasted, they marked. Some of them seemed to write full novels. And the candidates? Well, they have to be patient. The verdict will take some time. Then the winners of the regional competitions will compete again in May, in Marseille, to reach the national level. It's a long way to become a MOF. All candidates need good luck and a bon appétit!